Sam: The Sense Ride at first glance screams quality and durability and while not the lightest trail shoe one can instantly see that for a very fair price you are getting a versatile and one should expect long lasting shoe. Jeff: Having just tested the S-Lab Ultra (RTR review) and the Sense Pro Max (RTR review), I was eager to review the Sense Ride and see how it compared. Out of the box, I was initially taken aback by the vibrant colors of the red/orange/maroon colorway of my Sense Ride (though over time, grew to accept it, if not actually like it), though there is at least a navy blue option for those looking to go a bit more stealth. Weight is about what I expected, light but not particularly feathery, 10 5/8 oz. for my US Men's size 10. It is immediately obvious that this is a very high quality shoe. I have heard references to this shoe being a "quiver killer", but is that really the case? Jeff: The upper is closer to an S-Lab shoe with Sensifit/Endofit and a lightweight but durable mesh with very smoothly integrated welded overlays. The upper is adequately breathable on warm to hot days, but is not the most airy shoe on the market. Foothold is excellent, particularly in the heel and midfoot. The Sense Ride has a more generous forefoot than the S-Lab, where I find myself having to snug the laces a bit tighter to hold my foot adequately on hard technical descents, but overall feels comfortable, snug and supportive. Sam: The upper is close to an S-Lab shoe but... it is of denser stiffer mesh with more substantial less pliable overlays. While the fit is superb it is not the out of the box impeccable foot hugging softer luxury and long run comfort of the Sense Ultra. A big part of the extra $60 for the Sense Ultra must come from the fabrication and materials of its upper. The toe bumper is thick and protective, without being obtrusive and integrates nicely with the overlays. Salomon is one of the few companies that truly nails the quicklace. They are very easy to adjust on the fly, provide uniform tension and there is a lace garage for excess lace and the adjustment pull. The Endofit really hugs and wraps the foot in a secure, stable and comfortable manner with a slipper like fit. The tongue is on the thin side, but is thicker than the Pro Max and about the same thickness of the S-Lab Ultra. Either way, it is adequate to protect from the somewhat hard, thin and possibly unforgiving quicklace. The heel collar is a perfect height with moderate padding and is quite comfortable. The heel counter is semi flexible, yet very protective and stable. Jeff: Fit is true to size and consistent with other Salomon shoes, performance oriented with slightly more room in the forefoot than an S-Lab and similar to the Pro Max. I think the more generous toe box will open up the Sense Ride to a greater range of feet than other previous models, but is by no means a wide shoe. Sam: Fit is true to size. The toe bumper does provide more overhead volume in the Sense Ride than Sense Ultra but in the end the softer lighter mesh and fewer overlays up front including a more minimal toe bumper of the Sense Ultra provide a more comfortable accommodating fit overall. The same denser overlays and thicker mesh provide a slightly more supportive fit in the Sense Ride around the lace up and beginning of the foot collar. The full length vibration reducing Opal Vibe (RTR article explaining the technology here) insert offers a great blend of response, cushion and dampening for long distances over rough terrain. At 27/19mm stack, it offers 1 mm more cushion than the S-Lab Ultra and is a bit more firm. I find the Vibe to be most noticeable on harder surfaces and longer downhills, but compared to the Pro Max (with 30/24mm cushioning), the advantage seems to be less significant. Either way, the Sense Ride provides a smooth and responsive ride that should satisfy most runners at any speed and distances up to 100k. Additionally, the Sense Ride has a substantial Ortholite liner for improved cushion and fit. Sam: As with Salomon's road shoes such as the S-Lab Sonic 2, Sonic, and Sonic Pro with Vibe (RTR review), the combination of a firm midsole and the Opal Vibe vibration reduction makes for a firmer yet not leg jarring ride, and is one that is especially responsive on firm surfaces. This said the firmer heel and high rear stack makes the heel a touch more unstable than I would like at slower paces on downhills. My concurrent testing of the Sense Ride and Sense Ultra (see below) indicated the Sense Ride does have a touch more forefoot cushion, protection and stability, again likely due to that firmer foam combined with Vibe. On trails, I prefer the overall softer landing of the Sense Ultra, with no Vibe but softer foam at the heel and then as it is dual density firmer upfront and the Pro Max with both Vibe and softer foam. The Premium Wet Traction Contagrip outsole is one of the more durable, versatile, high performance and grippy outsoles on the market. The Profilm adds good rock protection and the flex grooves provide added flexibility to the shoe, allowing for a nice blend of trail feel/contouring and sturdy rock protection. I have about 60 rough miles on the Sense ride and 90 rough to brutal miles on the S-Lab Ultra with hardly any signs of wear. In the photo below, on the left is the S-Lab Ultra ((RTR review), with the Sense Ride on the right. The lug pattern, shape, depth, compound and configuration are nearly identical. Performance is amazing on a very wide variety of conditions, especially in the wet and transferring wet to dry. I really appreciate the Premium Wet Traction Contagrip on days where the terrain was almost always wet, transferring from wet trail, snow and hopping across rocks, both of these shoes always stuck, even when I worried they may not. The lugs are low profile enough for smooth door to trail transition and versatility, but offer plenty of bite in loose terrain and snow. The flex grooves in the Sense Ride make it look more flexible than the S-Lab Ultra, but the Ultra is a bit less stiff and more compliant, as well as being more responsive. The Sense Ride is a very versatile shoe for door to trail, dirt roads, smooth singletrack and also able to handle just about the worst trail and off trail conditions/terrain you can find. At first, I found the Sense Ride to be a bit stiff and slightly unforgiving (at least in comparison to the S-Lab Ultra), but after several runs, found that it broke in nicely, becoming increasingly flexible and more comfortable. The Sense Ride is not quite as light, responsive and quick as the Ultra, but I think for the majority of runners, the difference will be minimal enough to not justify the additional $60 upgrade to the S-Lab. Which leads me to what I like most about the Sense Ride, the value. At $120, I think this is an amazing shoe that offers great performance and an impressive list of premium features that much resemble an S-Lab model shoe. I consider the wide variety of runners/hikers that I see on the trails in the hugely popular Speedcross, on relatively benign terrain, where such deep and pronounced lugs are overkill much of the time. The Sense Ride is a more reasonable option for most people, most of the time, not to mention the wider forefoot will accommodate a wider range of feet. I would recommend the Sense Ride as a daily trainer for just about any terrain/distance and would not hesitate to use it as a race shoe. Side by side with the S-Lab Ultra. The Ultra has better fit/foothold (at least for me) and performs better in technical terrain. You can see in the below photo that the Ultra laces do not need to be cinched as tight, where the Ride, I need to crank them fairly tight for adequate hold in rocky technical terrain. The S-Lab feels more quick, nimble and agile, but the Ride is not too far behind. The Pro Max has a similar fit, but the lacing is such that I have to really crank them super tight to hold my foot in technical terrain, further exacerbated by the higher stack. Even then, control is not quite as good. The Pro Max is better for longer distances at slower speeds and is more suited to moderate terrain. -.1 somewhat difficult to attain perfect lacing/forefoot fit for all types of terrain and paces, requiring on the fly adjustments. Sam: I agree with Jeff that the Sense Ride is a great value in a versatile, well built, do anything trail runner. Yes, it can for sure be a single shoe in the trail and door to trail runner's quiver. My only real qualms with the Sense Ride is that I think the heel is a touch to firm and as a result not as stable in the rear as the other Salomon discussed here. This said if you are a Salomon fan, and can afford more than one pair the luxurious comfort and agility of the Sense Ultra can't be beat for faster long efforts and for cruising along with great cushion and stability at slower paces on all terrain the ProMax would be my picks. -0.1 for firm ride especially at the heel, a touch softer foam overall would be welcome. -0.1 agreeing with Jeff for lacing difficulty, I think due to thickness of overlays making a wrap more difficult. I chose four trail shoes the Nike Air Zoom Terra Kiger 4, Hoka One One Speedgoat 2, Salomon S-Lab Sense Ultra and Sense Ride for a side by side comparison taking careful note of what I felt and their performance. Jeff Valliere has just completed full reviews of the Sense Ultra here and Speedgoat 2 here. The Sense Ultra would be the choice for faster long runs and ultras for those who want plenty of trail feel and also for those who have some door to trail on their routes as it is a fine shoe on the road. If you want almost everything the Sense Ultra offers, understanding it has a snugger but still comfortable upper, is firmer overall and has a touch more cushioning upfront than the Sense Ultra, but not quite the heel stability of the Sense Ultra, or the other three, for $60 less the Sense Ride is a great choice. For full reviews of the 2017 Salomon line including: Sense Ultra, Pro Max, S-Lab Sonic 2, Sonic, and Sense Ultra Set vests go to the Salomon section of our index page here. The page has dozens of other 2017 in depth shoe reviews for Road and Trail including all other shoes covered here. The shoes mentioned in this article were provided at no charge. The opinions are entirely the authors'. The Salomon Sense Ride is available now from the stores below! Purchases help support Road Trail Run. Thanks! Use Coupon Code RTR10 for an additional 10% off! Thanks for the review, but I really wish Jeff would have done a comparison himself with several similar models. It's the one thing I like most with the reviews here. 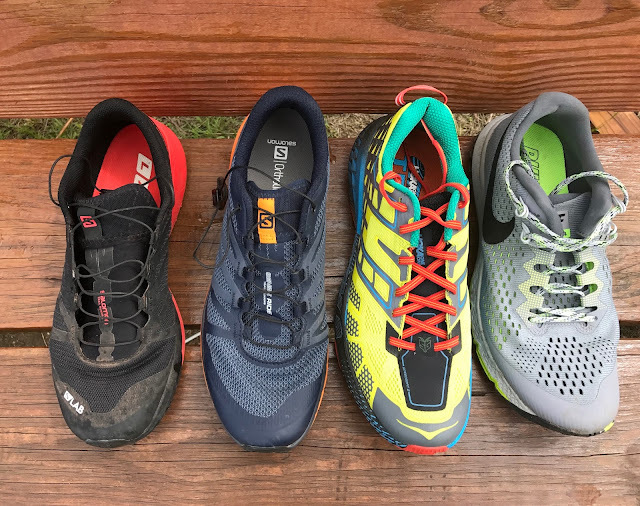 As primarily a Mountain runner in the West, my last 3 shoe purchases were based on Jeff's comparison in the review themselves - Akasha, Peregrine 7, Speedgoat 2 - and they have been exceptional choices. Thanks for reading John and I really appreciate your appreciation of my comparisons. Since Sam and I performed a joint review of the Sense Ride, I let him handle the comparisons due to time constraints (sorry). I pretty much agree with all that Sam wrote regarding how the shoes compare, though have not run in the Kiger. Please let me know if you have any specific questions as to how the Sense Ride compares to any of the shoes we have tested. Thanks again! Great review, guys! How does this shoe stack up to the Sense Pro? Is it replacing it as it looks so similar? Hi Dan, Thanks for writing. I have not run the Sense Pro 2 but by the numbers and construction there are some clear differences. Pro 2 is 23mm heel/17 mm, 6mm drop while Sense Ride is 27/19, 8mm drop. Pro is 9.2 oz while Ride is 9.7. Ride has the Vibe insert while Pro 2 is just Energy Cell+. There are also differences in the outsole with the Ride having a fuller coverage of rubber, fewer windows through. My "sense" is that the Ride would be more cushioned and maybe a touch less agile but overall a more versatile shoe especially for longer runs on tougher terrain. This is just a small quibble that I think pervades the entirety of Salomon models. Their speed laces clamp down over the garage pocket, kind of defeating the purpose of speed laces. You have to tinker with the tied lace to pull out the garage flap to let you tuck the slack from the lace into the garage. Seems like this could be designed better, and it would save me five seconds or more every time I lace up. And hey, that adds up over a lifetime of trail running. Tripp I agree. Not a huge fan of the long standing speed lace. I am testing a La Sportiva Uragano GTX where it a lace up with a garage below lace up as upper wraps over the top of most of the lacing. Works better so far, easier to tuck in. I like the speedlace just fine, but by the time you fiddle around getting it all tucked away in the lace garage, it is actually slower than just a normal lace. Where I have found the speedlace to be a real advantage though is with a shoe like the XA Alpine or the Saucony Razor Ice where it can be difficult to pull and tie laces with a built in gaiter in the way. You also do not need to tuck the speedlace anywhere, as it just lays anywhere under the zipped gaiter. I really wish the Crossover GTX had a speedlace. How would you compare the Sense Ride with the S-Lab Wings 8? I am very interested in the Ride and Vibe technology, but noticed that RE has the 8 on sale and didn't want to pass up a S-Lab shoe at that price if substantially superior. I meant RW, not RE. Bought the sense ultra based on your previous review. Any plans to review the sense 6 or sense 6SG? Hi Chad, Thanks for writing! I How do you like the Sense Ultra. I am finding them superb on smoother UT single track, so comfortable. tested the S-Lab Wings here http://www.roadtrailrun.com/2015/11/review-salomon-s-lab-wings-well.html It is a snugger, firmer, stiffer and more protective shoe but all in all fairly close to the Sense Ride. My version of the 8 is earlier and maybe a bit firmer than what RW has on sale if memory servesThe Wings is best on the super technical and rocky trails. It's about the only trail shoe I would wear in the White Mountains of NH but is a bit much for smoother single track here in UT. What kind of trails do you run? Jeff, on your comparison between the shoes at the end you state that the roomiest upper in the forefoot is the sense ultra. Perhaps I misunderstood the the intended meaning here, but I have the terra kiger side by side with the sense ultra and the terra kiger is significantly wider. Probably 10mm on the sole and about 5mm in the upper (the kiger has more flare on the sole). My comparison is on a Size 9.5 US. I have found the kiger to be lacking in control in very technical terrain (sliding off the sole unit) but the sense ultra seems tighter offering better control in technical terrain. I just wish it was a more modest (4mm?) drop! Hi The Stoat, Thanks for writing! Where are your technical trails what kind of terrain? Jeff did not run the Kiger 4 but I did. 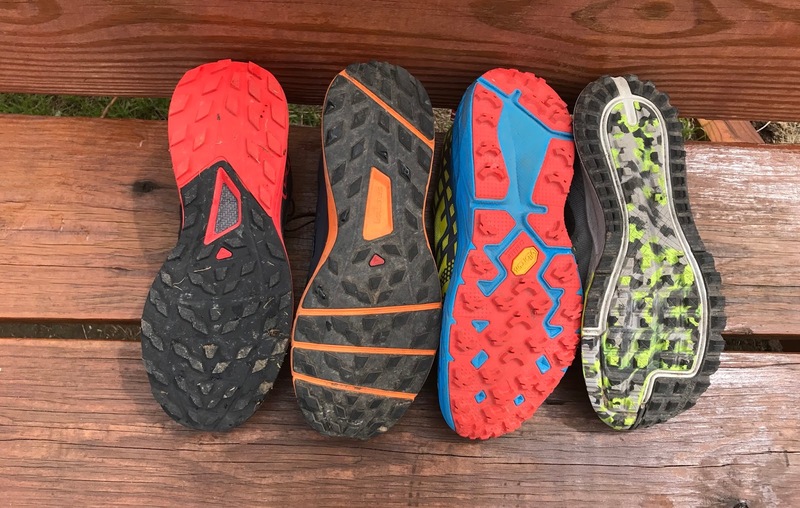 I said: "The roomiest forefoot of the bunch and most comfortable upper of the lot is on the Sense Ultra, followed by the Kiger 4 with its snug but fairly broad up front engineered Flymesh and no overlays. ". The Kiger is "wider" by your measurements is of denser, heavier, slightly less pliable mesh with more holes and has no overlays as the Sense Ultra has, the Kiger relying entirely on the double inner bootie and mesh for support at mid foot and to the front. I find the Sense Ultra to be roomier due to its lighter mesh and also what appears to be a bit more toe height volume due to its firmer higher very front toe bumper and midsole outsole which does not as abruptly rise to the toe. It is sublime up front. I have had no issues with rolling on technical terrain with the Kiger but I also don't push technical terrain very hard. I can see how one might slide off the midsole if pushed. This said I do find its rear of the foot support superior to the Sense Ultra, maybe due to the inclusion of the 2 Flywire cords and the lower drop this despite the rear being far more minimal and built up than the Sense Ultra's. I do think neither shoe is really intended for the most technical terrain and are more focused on speed and agility. Both are superb. Thanks for the reply Sam! I primarily run very rough Ozark gravel roads interspersed with sections of pavement. I do some fairly technical trail running when I'm able to hit the trails, but mostly on the gravel roads around my house. I've tried both road and trail shoes and just about decided that I'd rather deals with lugs on pavement that endure another turf toe/stone bruise that no doubt was caused by running in road shoes on gravel. I have used the Rtr10 code and will continue to do so - I'm a huge fan of you guys' work. Hi Sam, Based in the UK and a lot of the races that I have done have a mix of rocky paths, but perhaps more challenging are the stretches tussocky open moor which are hard to 'read' and often result in rolled ankles. For up to marathon distance the Inov8 X-Talons, the S-Lab Speeds or even the Sense SG all do well but I suspect that I need a bit more cushioning on ultras and up until now have used the Kigers. I think that Sense Ultra is going to be pretty good with the little bit of extra cushioning over the original Sense but a bit more control than the Kigers. I agree that the heel in the Kigers is better - as you say, I put this down to the better lacing and lower drop in the Kiger. I wish they hadn't chosen to make the sense ultra into high heels... I'll see how I get on with them over time - I may have to try some surgery to take some height out of the heel! I have been using the Hoka Speedgoat 2 this summer for fast day hiking (bad knee). I have been happy with the shoe but wanted to try the Ride. Just got mine today from Running Warehouse (thanks for the coupon code.). I have a low volume foot so lasting seems good. I am surprised by the toe box height I am concerned that if it’s low now it will be problematic when my feet swell. Any thoughts? Is there an new version Sense ride 2 coming out? In you opinion which is the most versatile Salomon trailshoe for long runs in easy terrain, fire roads and paved roads? Ante here again! Sense ride 2 is out would be very interesting to read a review of the new model. Thanks for the best running shoe site! Thanks for kind works! We just received Ride 2 and will be testing.